The Night Market is a festival that occurs between the 15th and 17th of Winter. Various boats and merchants will appear at the docks on The Beach, and offer to sell goods or take the player for a boat ride. The Night Market is open between 5pm and 2am, but the Submarine Ride closes at 11pm, and the Mermaid Boat closes at 12:30am. 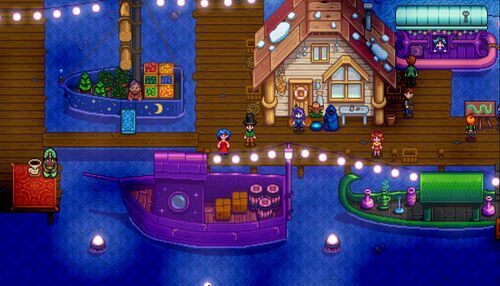 Unlike other festivals, shops and homes throughout Stardew Valley (including the beach) are not closed on the days of the Night Market, and time continues to pass during the festival. Animals also need to be fed during the Night Market event; the game will not automatically consider them to be fed as with other Festivals. The Coffee Merchant will give the player a free cup of coffee. It is possible to repeatedly obtain coffee every 10 in-game minutes. Exploiting this generosity allows the player to gain 162 cups of coffee, worth 24,300g, over the three days of the Night Market. The blue boat between the docks sells a variety of purely aesthetic decorations, some of which change with the seasons. Players can purchase an unlimited number of each decoration. Decorations can be placed indoors or outdoors. The Decoration Boat is the only place where the candy cane decorations can be purchased. Seasonal Decor and the Seasonal Plants can be purchased at other festivals/shops. Famous Painter Lupini sells a different painting each day of the Night Market for 1,200g. The paintings rotate over a 3-year schedule, for a total of 9 paintings. '1000 Years From Now' Winter 16 2, 5, 8, 11, etc. 'Clouds' Winter 15 2, 5, 8, 11, etc. 'Land Of Clay' Winter 17 3, 6, 9, 12, etc. 'Portrait Of A Mermaid' Winter 16 1, 4, 7, 10, etc. 'Red Eagle' Winter 15 1, 4, 7, 10, etc. 'Solar Kingdom' Winter 17 1, 4, 7, 10, etc. 'The Serpent' Winter 15 3, 6, 9, 12, etc. 'Three Trees' Winter 17 2, 5, 8, 11, etc. 'Tropical Fish #173' Winter 16 3, 6, 9, 12, etc. The Submarine houses a Captain who offers to take the player on a deep-sea fishing tour for 1,000g. Upon accepting, the submarine will begin descending, opening a trapdoor at the bottom to allow the player to fish. The descent and ascent take approximately 30 minutes in-game time. In singleplayer mode, the player can avoid this time expenditure by opening the inventory; the submarine floor will close/open and the descent/ascent will happen despite the halting of time passage. Three fish can only be caught here: the Midnight Squid, Spook Fish, and Blobfish. Seaweed, Sea Cucumber, Octopus, and Super Cucumber can also be caught in the submarine ride. There is also a rare chance to catch a Pearl while fishing here. The table below shows the chance of catching each item while fishing in the submarine. The magic shop boat is located to the right of Famous Painter Lupini. It sells decorative items, seeds, a unique hat, and a unique fireplace, with different stock each night. Each item may be purchased in unlimited quantities. Seed sell prices are the same as at Pierre's General Store. Note that Garlic Seeds, Red Cabbage Seeds, and Artichoke Seeds are not available until game year 2. Note also that the price of the Cone Hat changes over the 3 days of the Night Market, with the lowest price occurring on Day 2. The Grave Stone sold on Day 1 costs 150g less at the Night Market than it does at the Spirit's Eve Festival. The Log Section sold on Day 3 costs 150g less at the Night Market than it does at the Carpenter's Shop. The Mermaid Boat is open from 5pm to 12:30am. Upon entering, a mermaid will appear and begin singing to the player, accompanied by a cutscene. Her performance lasts 1 hour and 40 mins, but the player may leave at any time. The player may also open inventory at any time, which will halt the passage of time in a singleplayer game. After the show, clam shells inside the boat can be clicked to play musical notes. Playing the correct notes in the correct sequence will award the player a special item. The correct sequence of musical notes can be found in Secret Note #15, although finding the secret note is not required to complete the sequence. Click below to see the solution and information about the special item awarded. When played in the order 1-5-4-2-3 (left to right), the player will be awarded with a Pearl. Only one Pearl can be obtained in the Mermaid Boat by each player per each saved game, but the Mermaid Show can be viewed repeatedly by exiting and re-entering the boat at any time. The Shrouded Figure offers to teleport the player back to their farm for 250g. The Traveling Cart makes an appearance at the docks with her cart on a raft. She sells a selection of her usual items, including the Wedding Ring recipe. Unlike other Festivals, villagers can be seen deviating from their normal schedules to walk to the beach to attend the Night Market. These villagers cannot be found outside the Night Market during the festival. The lists below show which villagers attend on which days each year. Note that talking and gifting to villagers during the Night Market will increase friendship with them, unlike at other festivals. It's also possible to complete Gathering, Slaying Monsters, and Fishing Quests during the Night Market. Talking to the villager will complete the quest, before scripted festival dialogue occurs. Villagers who are married to the player do not attend the Night Market, but instead follow their normal Monday/Tuesday/Wednesday marriage schedules. Note that there is a bug in v1.3 which prevents Shane from leaving Marnie's Ranch to attend the Night Market. Instead, he remains inside the Ranch all day. “ “Starting tomorrow, a traveling merchant fleet will dock at Pelican Town for the yearly night market. The market starts at 5pm, and will be in port for the next three days. Since the game uses a unique beach map during festival days, items a player has placed on the beach (crab pots, chests, etc.) may disappear during the Night Market. These items should return on Winter 18. Additionally, items that can usually be foraged on the Beach will be unavailable due to the event. The unique map also doesn't reflect the bridge repair, so that area of the Beach won't be accessible during these days. Fishing while the merchant fleet is present can cause obstruction to fishing, but there are a couple spots where you can still fish. However, fishing while the merchant fleet is docked will only yield Trash. The 'Red Eagle' painting from Famous Painter Lupini is in the art style of the Native American tribe Hopi. Occasionally, a mermaid may be seen swimming up past the window behind the submarine captain. This page was last modified on 17 March 2019, at 17:21.